Bringing the same perceptive and actionable advice that made Breaking the Good Mom Myth an international bestseller, TV host and psychotherapist Alyson Schafer again comes to the rescue of desperate parents everywhere. 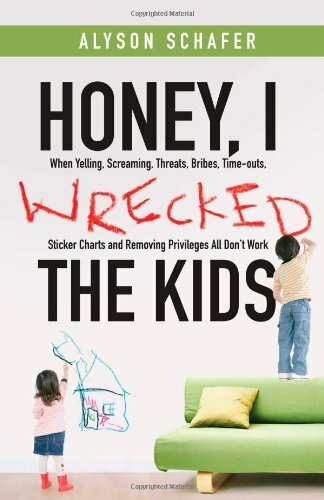 For those who've tried just about everything to discipline their kids, Honey, I Wrecked the Kids explains why children today really are resistant to traditional parenting methods and how only a new model for winning cooperation really works. Full of real-life examples, the book gives parents a deeper understanding of misbehavior and their role in it, shies away from traditional behavioral models of parenting, and offers humane, good-humored advice that will make parenting a manageable and, finally, rewarding task. Alyson Schafer (Toronto, ON) is the host of The Parenting Show and a media expert on parenting. She has appeared on The Montel Williams Show and been featured in Cosmopolitan, Parenting, Reader's Digest, and more.